Construction sites are evolving rapidly. Isachsen, a leading construction company in Norway, shakes up project tracking with Pix4Dbim. Unforeseen work and any change in plans, schedules, processes, or operations are costly. Using drones, Pix4D’s drone mapping software and a smart combination of desktop and cloud processing, the construction company Isachsen routinely monitors projects, keeps track of and document changes, and easily communicates the site status to all stakeholders, including their end-client. Save thousands of dollars in dirt work. Collecting images from a drone and processing them to create real-time, accurate, and measurable 2D and 3D data, such as orthophotos and point clouds, can potentially save thousands of dollars in dirt work. For instance, you can verify the foundation is built to spec and the water will drain properly. 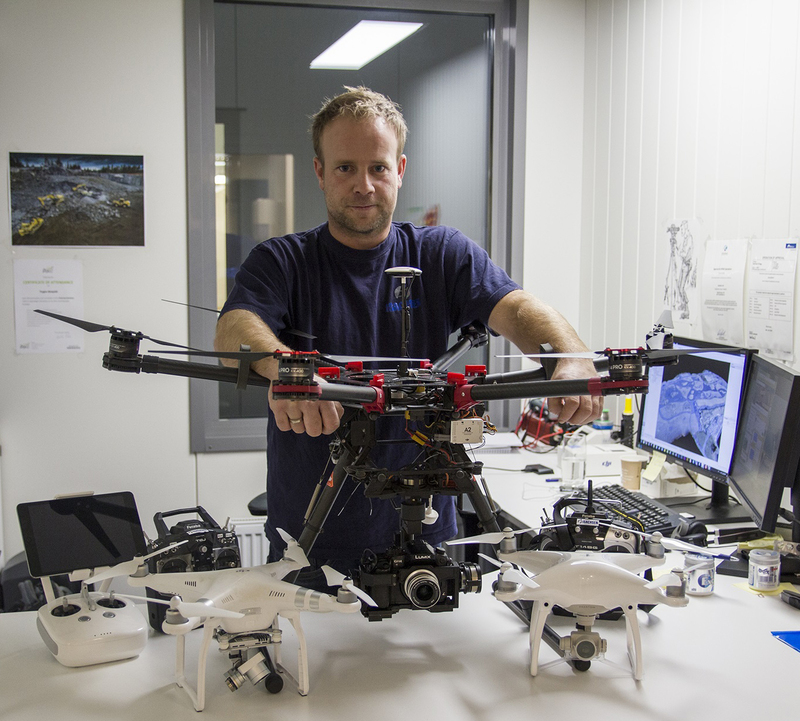 Trygve Almquist is a surveyor at Isachsen in charge of the drone fleet within the company. Trygve’s role is to process all the images collected by the field operators then analyze and communicate the results. Working on earthworks for a big jobsite tunnel in the mountains, in Drammen, Norway, Trygve spoke about their well-oiled processes, why they use a drone to survey the site, and how they use Pix4Dbim to process data. Headquartered in Norway, Isachsen is a $280 million construction company, part of BetonmastHæhre, with 600 employees. The company specializes in the construction of roads, tunnels, and railways, usually working on multiple projects at the same time. With 25 drones, and the ambition to equip every field operator with a drone — 50 in total — Isachsen is a pioneer when it comes to using drones to map their large construction projects. 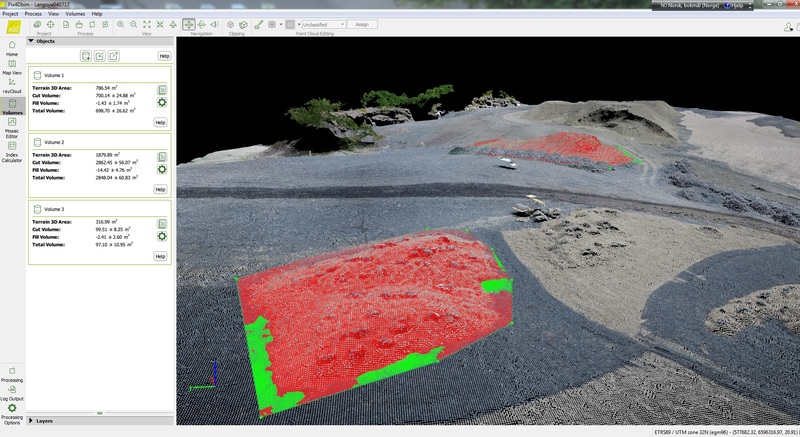 Whether it’s for pre-construction topographic survey, earthwork calculations, or client documentation, they have been using Pix4D drone mapping software for a few years. For the tunnel project in Drammen, the team flies three different sites. They use a DJI Phantom 4 Pro. Ground Control Points (GCPs) have been distributed permanently all over the area of interest and they are checked regularly. The objective is to fly once a week, or at least every two weeks, to get regular as-built updates. “With this type of site, we need to fly a lot – more often than mining for instance – because everything changes so quickly on the ground,” comments Trygve. For Isachsen, drones have become one of the most cost-effective tools for surveying projects and help the ground decision-making process. Drone mapping is so inexpensive, non-intrusive and fast that the company can afford to do it over-and-over again during the entire project— something not possible before with traditional surveying. 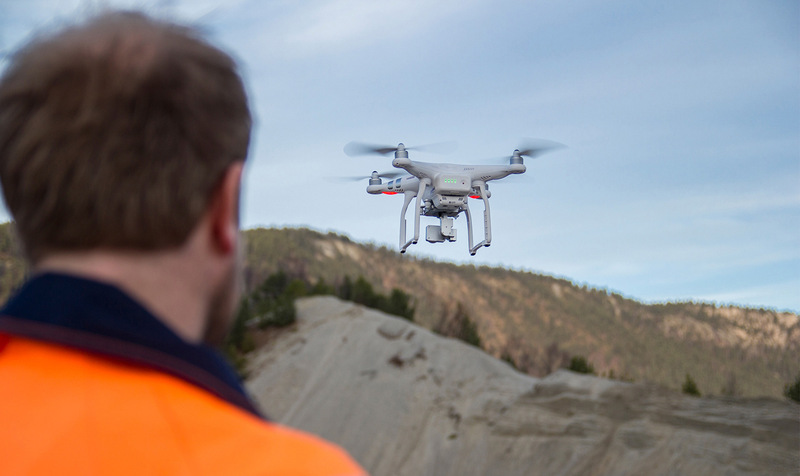 Drones are the aerial eye of the jobsite, helping the company work faster and more productively. “Flying a drone is easy and benefits are huge,” continues Trygve. “Getting stockpiles surveyed for volume reconciliations is time-consuming, and costly – unless you use a drone to survey your site and drone mapping software to process your data. When surveyors deliver results in a couple of days, drone-mapping takes only a few hours. With a drone, we get the big picture of the overall site. We can quickly collect real-time data from projects to make on-the-ground decisions quicker and identify potential issues before they become costly”. With Pix4Dbim software, Trygve can choose to process the captured images either on the cloud or on desktop and then upload results from one application to the other. When some surveys require more complex measurements and higher accuracy, such as cut and fill information for earthworks, Trygve uses the Pix4Dbim desktop application to process the data. Processing takes a bit longer but enables him to better control his results by being able to edit or add ground control points (GCPs). The results are then used to calculate volumes and generate contour maps. Having the flexibility to decide on the most adaptable workflow for his project and combine both applications is strongly valuable for his work. With the desktop application, Trygve benefits from more advanced editing options. Most importantly, in just a few clicks, he can upload the project to the Pix4Dbim cloud platform where he can then take full advantage of additional assets such as-built comparison and collaborative tools. 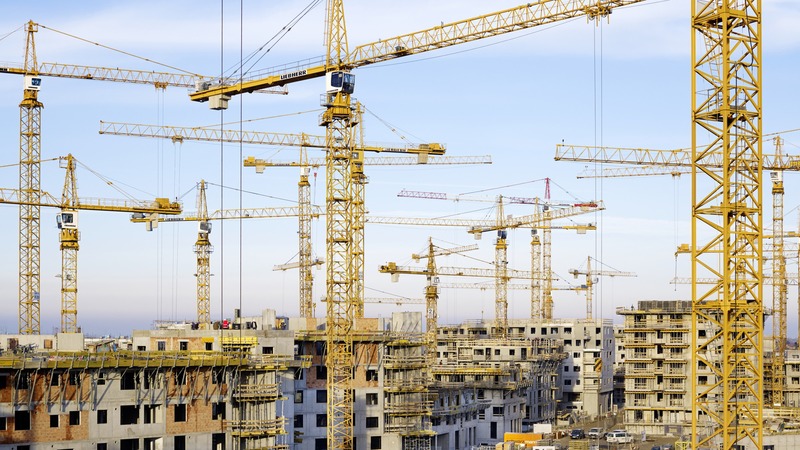 One of the biggest challenges on large construction projects lies in the number of stakeholders that need to work together and be informed about site progress. Well aware of the challenge, Trygve uses the Pix4Dbim cloud platform to facilitate work between all the project teams, from the engineers to the field operators. All surveys are available on it, “even if we don’t process it on the desktop, we process the survey on the cloud, so people know we have the dataset from that specific day if needed. If they need a volume calculation, they can call me, I have all the data”, explains Trygve. By sharing a link to the project, all project members have remote access to the site to visualize and analyze the situation from the drone-generated maps and 3D models. They are able to extract powerful insights using built-in tools to measure distances and areas, make annotations, follow progress on a timeline, and compare the as-built with CAD drawings. Deviations can then be identified more quickly, the team can be more proactive and make faster decisions based on the latest and most accurate facts and not guesses. Problems and delays are just avoided. Easy remote access to all project milestones. Not only used as a team collaboration tool, Trygve also uses the Pix4Dbim cloud platform as a communication and documentation platform to improve their customer offer. By having all regularly repeated site surveys accessible online within one project, Trygve offers his client easy remote access to all project milestones. With a simple click, they have access to month-old documentation. This is of huge value for Isachsen, especially in the billing process and the quality control of the project. They can prevent any disputes, saving the company time and money by ensuring that work has been completed, or proving why the changes were needed and not part of the original project contract. “The Pix4Dbim cloud platform is good for georeferenced documentation when billing. The site evolution is fully documented. We keep track of what is done and what remains to be done. We track piles, differences made from original ground to present time, but also differences between contract and what is actually constructed. This is why the timeline is so valuable to us. If there is any disagreement or changes made to the contract, we use those surveys. Those are proofs in case of disputes. Keeping track and documenting through Pix4Dbim cloud potentially saves us thousands of dollars by proving our client the work has been done, and why it was necessary”. Want to know how Pix4Dbim can help your business? Learn more or start a free trial.